This talk defends the appropriateness and demonstrates the merits of utilizing philosophical distinctions concerning ontology and function for addressing controversial issues concerning the beliefs of early Christians. A number of scholars such as Yabro Collins and Gordon Fee have distinguished between the functional and the ontological with reference to the status of Christ in early Christianity. Others have objected that engaging in ontological-functional categories is more a philosophical and theological exercise rather than a historical one. Dr. Loke replies to this objection by arguing that later knowledge can be employed in the study of earlier history to fulfil an explanatory function. Here, the explanatory function is to make sense of what the early Christian writers were trying to convey when they portray Christ to be equal with the Father in some sense and yet lower than the Father in another. He defends his approach against the charge of anachronism, and replies to other objections by distinguishing between valid and invalid ways of arguing from function to ontology. He demonstrates that the availability of the functional alternative implies that the conclusion of ontological enhancement cannot be inferred from certain passages in early Christian writings, which have been controversially interpreted in an Adoptionist manner by a number of historians of early Christianity such as Bart Ehrman and Michael Peppard. 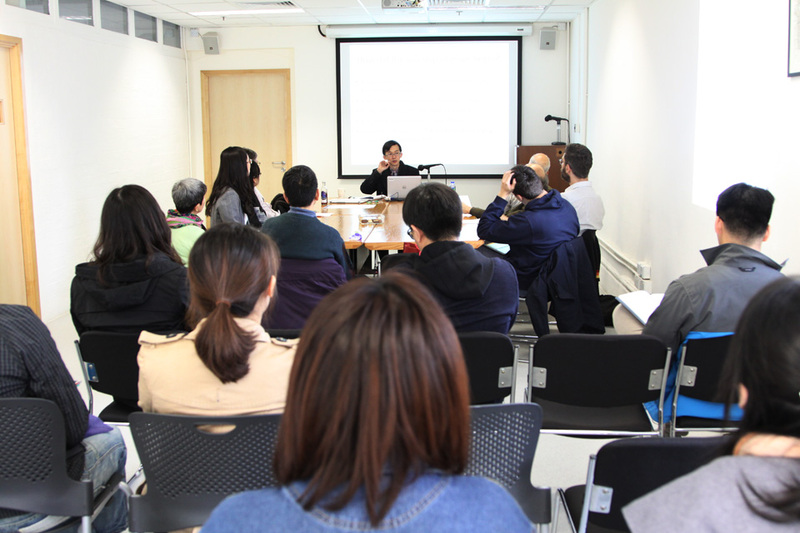 This talk illustrates that a transdisciplinary approach can be useful for the study of the history of a religion. 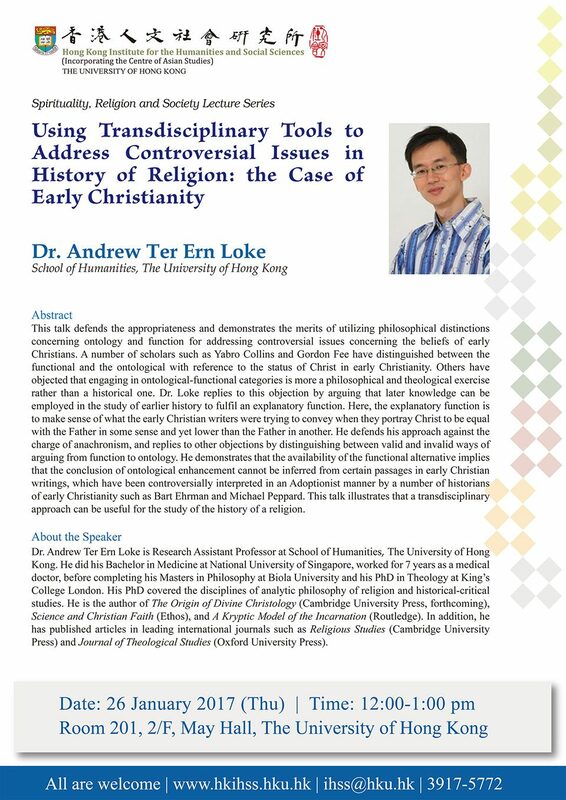 Dr. Andrew Ter Ern Loke is Research Assistant Professor at School of Humanities, The University of Hong Kong. He did his Bachelor in Medicine at National University of Singapore, worked for 7 years as a medical doctor, before completing his Masters in Philosophy at Biola University and his PhD in Theology at King’s College London. His PhD covered the disciplines of analytic philosophy of religion and historical-critical studies. He is the author of The Origin of Divine Christology (Cambridge University Press, forthcoming), Science and Christian Faith (Ethos), and A Kryptic Model of the Incarnation (Routledge). 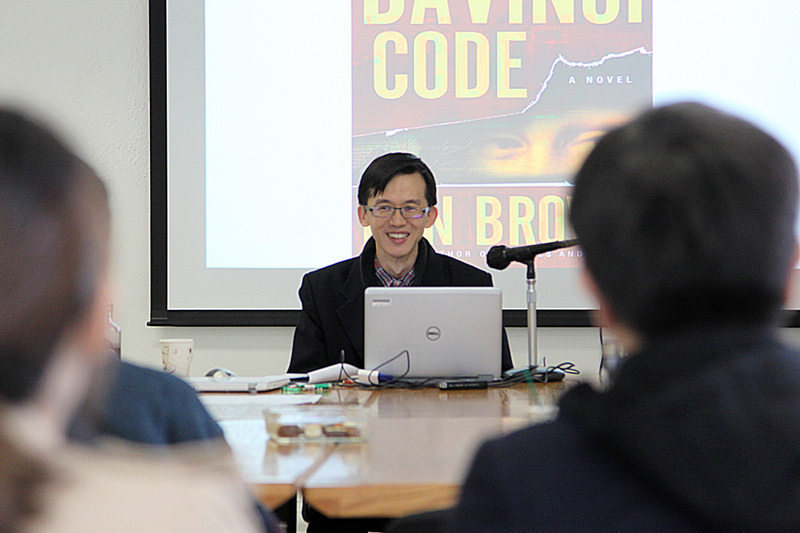 In addition, he has published articles in leading international journals such as Religious Studies (Cambridge University Press) and Journal of Theological Studies (Oxford University Press).